If you are an essential oil user, this collection of recipes is meant to help you enjoy those holiday moments by incorporating your favorite oils into some great traditions. They can really give you more bang for your buck as far as getting great scents and flavors for quite a lesser amount of product and they also have such wonderful benefits for your health so it’s a win-win for sure! • Holiday Time Protection Blend – It is so easy to get totally worn out and easily pick up those germs and viruses that tend to float around during these times of the year. This blend is meant to help protect you and you’re your immune system healthy and ready to take on the world. • Top it off with your favorite carrier oil, such as Fractionated Coconut Oil or Sweet Almond Oil. • Add a cute label and you are all set to use it or give as a gift! Just roll it on the bottom of the feet or down the spine when you start feeling worn down, or like you may be coming down with something. It can be used once or twice a week on yourself or your kids as a protective measure. • Holiday Fatigue Remedy – This blend is perfect for the afternoon slumps, and is great for use during those times of lots of errands, packing, preparing for parties or anything else that may bring you to a slow pace when you need to be on the go. Add to the wrists, back of the neck and/or temples anytime you need a pick me up! Inhale it right from the wrists, too. Smells wonderful! • Diffuse 2 drops Rosemary Essential Oil, 2 drops Peppermint Essential Oil and 2 drops Orange Essential Oil when you need to wake up and focus on any task. Great for study time, but also after a big meal or a long day! • 2 drops Frankincense Essential Oi,l 2 drops Myrrh Essential Oil, 3 drops Orange Essential Oil and 2 drops Cedarwood Essential Oil. This one has a unique smell that is spicy and woodsy and definitely makes you think holidays. • 5 drops of Spearmint Essential Oil and 3 to 5 drops of Cardamom Essential Oil plus 2 drops Orange Essential Oil. Fantastic combo, perfect for the holidays! • 3 drops Orange Essential Oil, 2 drops Cinnamon Essential Oil and 3 drops White Fir Essential Oil in your diffuser. The smells of Christmas! • Make your favorite hot chocolate and add in 1 to 2 drops of Peppermint Essential Oil and stir well. If it sits very long, be sure to stir it again before drinking as the oil will rise to the top – and you’ll have one minty sip in your mouth – so stir! • Add 1 to 2 drops Cinnamon Essential Oil to your favorite hot chocolate or coffee for an awesome kick. Be sure not to do more drops than that, it is potent stuff but so tasty! • Make stir sticks for a party by soaking the sticks in a Ziploc bag with about 4 or 5 drops of cinnamon or Peppermint Essential Oil if you choose that instead. • If you are only doing a few, like less than ten sticks, then just use about 3 drops of the oil instead. • Let them sit overnight and they will soak up the oil. • This can also be done with toothpicks as well! They are great with Peppermint Essential Oil or Spearmint Essential Oil! • This is perfect for teacher gifts or for small favors for party guests or family that are visiting. You can change the color of the salts with different food coloring drops, so you can make them more for Thanksgiving by adding Orange Essential Oil or choose red with Peppermint Essential Oil for Christmastime. • Fill an empty ornament ball with 2/3 Epsom salt or sea salt and 1/3 baking soda. • Leave just a little bit of room at the top. • Pour the mixture from the ornament into a mixing bowl and add in 2 to 3 drops of your choice of oils, a teaspoon of dried flower petals if your choice, and a drop of food coloring for color. • Mix well in bowl and then add back into ornament and tie on a cute ribbon for the hanger. 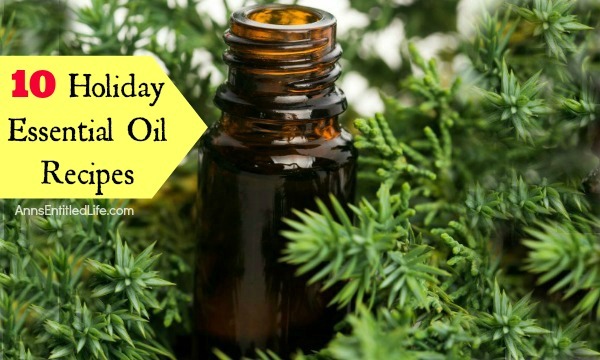 Some suggestions are: Green coloring with a woodsy scent like Cedarwood Essential Oil or White Fir Essential Oil, Orange coloring with Orange Essential Oil or Orange and Cardamom Essential Oil mixed, or red coloring with Peppermint Essential Oil. 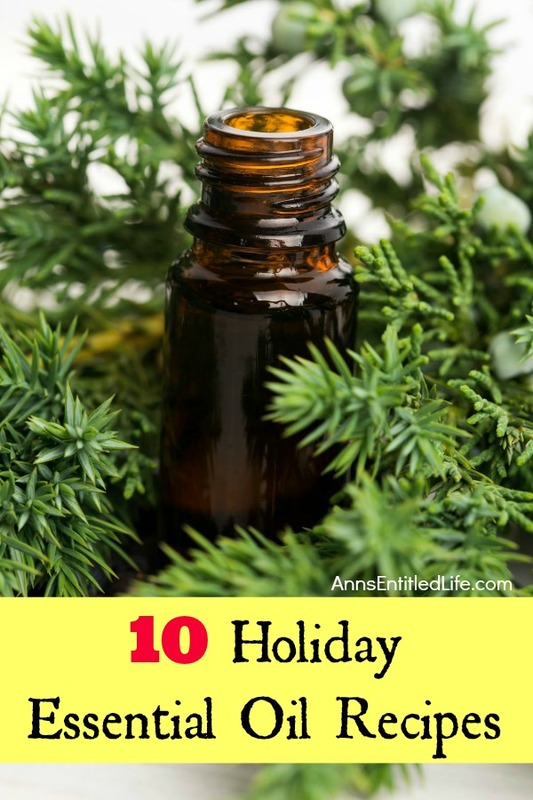 Do you have any holiday essential oil recipes you’d like to share? • For more DIY Beauty on Ann’s Entitled Life, click here.